Easiest way possible to make a marking awl. Quick and easy project to spend some good time with my lates! 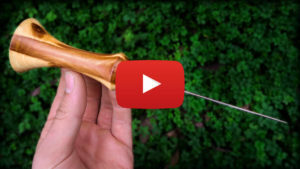 The awl is a very handy tool to mark or pierce holes in wood and leather and for many other application that require a long and pointy tool. I used the other one I have very often in the shop. Using a large needle for the spike seems very convenient because it’s already the right shape, made of hardened steel and can be replaced very easily if it ever breaks. Also extremely cheap, I bought the four pack of needles you see in the video for only 1€.